When I was little girl, my grandparents would take me to their favorite French Restaurant and my Grandfather would always order Escargot, I loved it too, but Grandma would curl up her nose, we would laugh and say more for us. 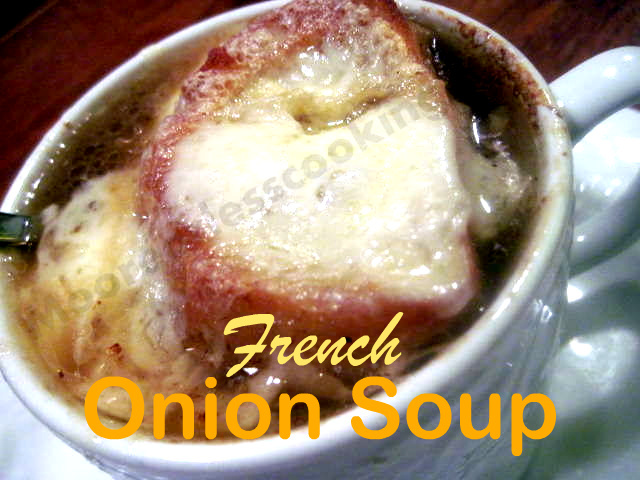 We would order the French Onion Soup. It was such a treat. The baguette and cheese on top of the caramelized onions and broth were the ultimate in flavor. This recipe is as close as I can get to these wonderful memories that I have as a child. I used to caramelize the onions on the stove top, but this way is so much easier and better. It does take some time, but having the onions roast in the oven perfects this recipe. I use Yellow or Red onions, or a combo of both. I also use broiler-safe crocks and keep the rim of the bowls 4 to 5 inches from the broiler to obtain a proper melting of the cheeses. Adjust oven rack to lower-middle position and heat oven to 400°. Generously spray inside of heavy-bottomed large (at least 7-quart) Dutch oven with nonstick cooking spray. Place butter in pot and add onions and 1 teaspoon salt. Cook, covered, 1 hour (onions will be moist and slightly reduced in volume).Remove pot from oven and stir onions, scraping bottom and sides of pot. Return pot to oven with lid slightly ajar and continue to cook until onions are very soft and golden brown, 1 1/2 to 1 3/4 hours longer, stirring onions and scraping bottom and sides of pot after 1 hour. Carefully remove pot from oven and place over medium-high heat. Using oven mitts to handle pot, cook onions, stirring frequently and scraping bottom and sides of pot, until liquid evaporates and onions brown, 15 to 20 minutes, reducing heat to medium if onions are browning too quickly. Continue to cook, stirring frequently, until pot bottom is coated with dark crust, 6 to 8 minutes, adjusting heat as necessary. Stir in 1/4 cup water, scraping pot bottom to loosen crust, and cook until water evaporates and pot bottom has formed another dark crust, 6 to 8 minutes. Repeat process of deglazing 2 or 3 more times, until onions are very dark brown. Stir in wine and balsamic vinegar, stirring frequently, until wine evaporates, about 5 minutes. Stir in broths, 2 cups water, the thyme, bay leaf and parsley (tied with twine or wrapped in cheese cloth for easy removal from pot) and 1/2 teaspoon salt, scraping up any final bits of browned crust on bottom and sides of pot. Increase heat to high and bring to simmer. Reduce heat to low, cover, and simmer 30 minutes. Remove and discard herbs, then season with salt and pepper to taste. For the croutons: While soup simmers, arrange baguette slices in single layer on baking sheet and bake in 400-degree oven until bread is dry, crisp, and golden at edges, about 10 minutes. Set aside. To serve: Adjust oven rack 4 to 6 inches from broiler and heat broiler. Set heat-safe soup bowls or crocks on rimmed baking sheet and fill each with about 1 1/2 cups soup. Top each bowl with two toasted baguette slices (try not to overlap) and divide Swiss cheese slices, laying them in a single layer, if possible, on bread. Sprinkle each serving with about 2 tablespoons grated Asiago cheese and broil until well browned and bubbly, 7 to 10 minutes. If using regular soup bowls, broil the toasts and the cheese only and then place the toasts on top of the soup. Cool 5 minutes and serve.